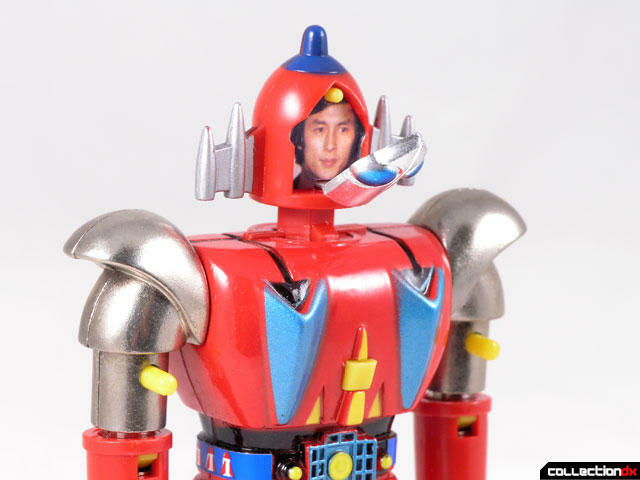 The show chronicled the adventures of Kenji, a young boy whose Father (Dr. Hayami) and two Brothers (Jouji and Ryuji) are kidnapped by the Robot Army Corps. When the Robot Army Corps invade Japan, a UFO carrying two robots arrive to save the day. The two robots are Sky Zero (スカイゼル - sukaizeru or Skyzel) who has Joji's spirit and Ground Zero (グランゼル - guranzeru or Granzel) which has Ryuji's spirit. Each of these robots was created by the kidnapped Dr. Hayami, who programmed them to have the spirit of Kenji's older brothers in them. 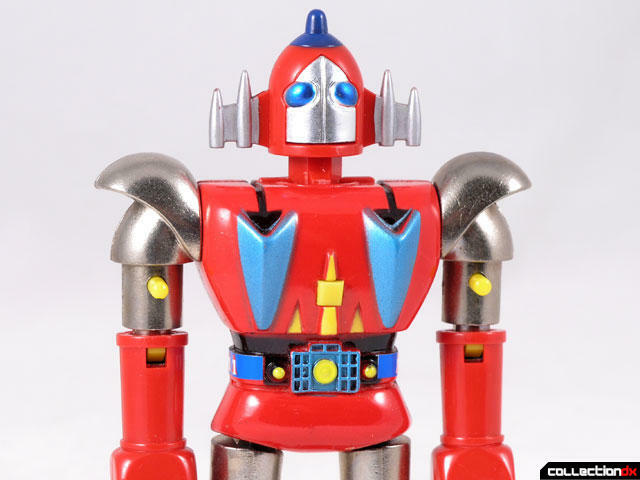 The robots purpose is to watch over young Kenji and protect the earth from the Robot Army Corps. 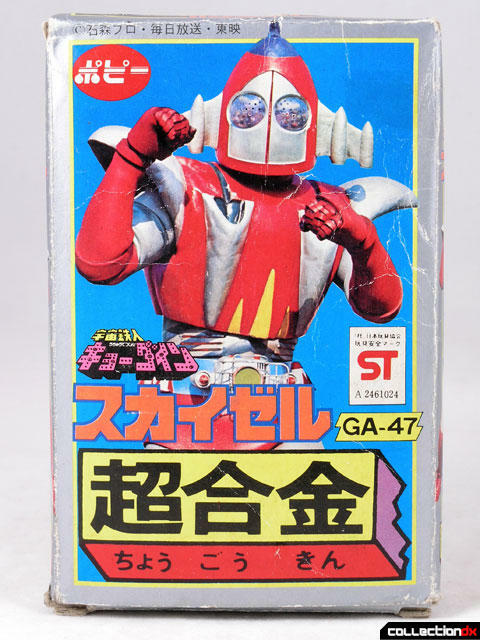 The Chogokin Skyzel was released by Popy in 1976. The thing is almost entirely metal, and weighs a ton. The paint is a nice crisp red and blue, which contrasts nicely against the bare metal. The detail is excellent, even the small darts are painted on the waist. Skyzel has a few cool gimmicks, like any chogokin should. 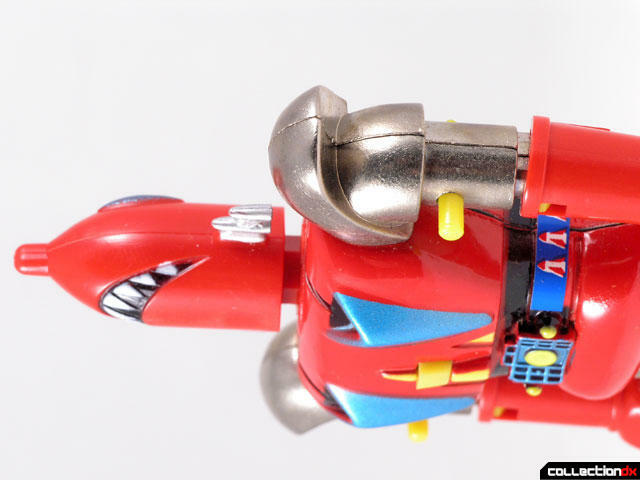 First both fists fire, but can only be placed in one position (sone other chogokin can be placed in two) The fists only latch in at the top, and the fit is a little loose, so they don't like to fit snugly against the upper arm. The head can be launched off by pressing a small button on the back. Skyzel also comes with a variant head to replicate the flying mode of Skyzel - Sky Missile. Probably the coolest feature of this toy is the famous open face gimmick. Press a small button on the back of the head and the face plate pops off to reveal the face of Joji, the man who's spirit is inside of Skyzel. 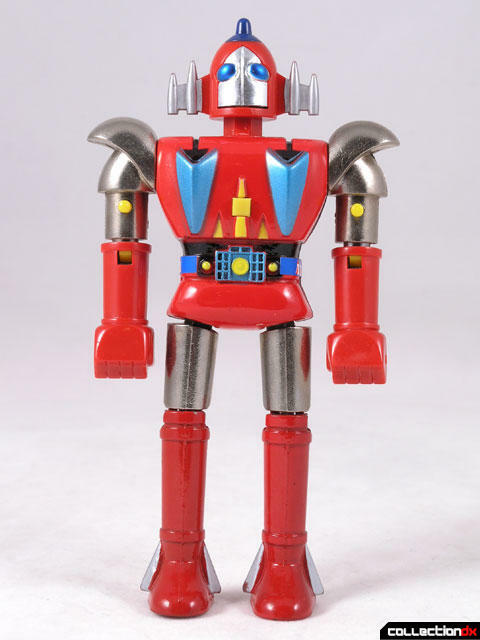 I've always thought that this toy really embodied the essence of Matte's Shogun Warriors Line, and thought they fit right in with the style of Great Mazinga, Dragun and Poseidon. In fact, two vehicles form Kyodain ended up being included in the Shogun Action Vehicle line - Grand Car and Sky Jet. I really want to get one of these and put carl sagan's face in the head. I may very well be the only person on the internet who's a Lucky Star fan who DIDN'T learn of Space Ironmen Kyodian from Konata's version of the opening.